Participating in racing is a natural progression after learning the fundamentals of sailing. Racing is a great opportunity to meet other sailors and enjoy the camaraderie that comes with spirited competition and learning both on and off the water. Members also participate in local and away regattas with the support of DSAO. Program race nights provide an opportunity for practicing racing and sailing skills on a race course. Race nights provide opportunities for learning and skill development that will prepare racers for a regatta experience. Towards the end of the season, the top racers in the weekly racing series will square off for the coveted title of Champion of Champion! Tuesday evening Learn to Race Program is an ideal opportunity for novice racers to learn about racing rules, start sequences and flags, starting line tactics, on course and finishing strategies and how to get the most out of the fun and social racing experience. Coaches and instructors will customize their teaching to the sailors in the group, run exercises on and off the water and answer questions. Thursday evening race night builds on the fundamentals of racing at a more advanced level. We are looking for volunteers to companion with our racers and help with race management for both Tuesday and Thursday evenings. 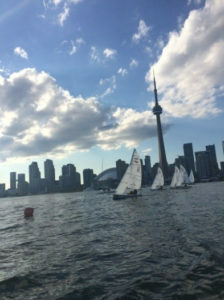 DSAO – Toronto supports our members who wish to participate in outside Regattas. DSAO – Toronto can provide resources including equipment, logistics and hands-on help. Members must contact the program staff if they wish to use any DSAO equipment for regattas. Calendar of Regattas - Coming soon!